At the outset of the project, the client actually had in mind a ring-binder system of materials that they could share with potential research candidates, but we felt this solution would not serve their needs best: On a functional level, a large, heavy binder system would not travel well; only a few could be mailed out before postage costs would put paid to further such distribution, which leaves in-person meetings for everyone else, requiring even more expense in human time and travel commitment. Additionally, if all the material was captured only in press-printed sheets (even if they were removable from the binder), any changes to programs, application procedures, contacts, or other information would be very expensive and logistically challenging to update properly. On a more ethereal level, we wanted to create a more organic presentation system that was reflective of a dynamic, collaborative program, as opposed to something more monolithic and institutional. 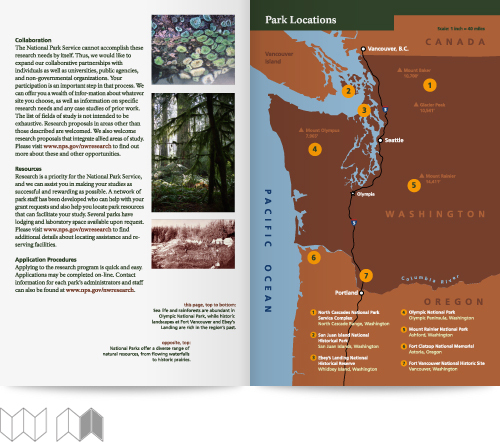 We suggested a two-pronged approach: create a slim brochure, top-lining the program benefits, potential areas of research and applicable parks. This piece could be easily and inexpensively mailed out to thousands of recipients. The goal of this piece would be to attract interest and drive readers to a web site where more comprehensive information and application material could be found and updated easily as necessary. 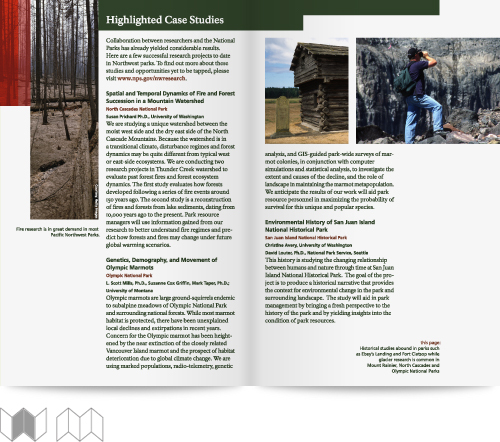 Appropriately, once we had the general parameters of the project worked out with the client, we took the opportunity to do our own research in the parks. We loaded up a car with camera equipment, a proper picnic of charcuterie and cheese, the most convincing mountain man (or woman) attire we could don for our modeling cameos (some were more convincing than others) and my girlfriend at the time (to serve as a female model). We hiked through the mountains, took in historical landmarks, scoured fields, braved cliffs and surveyed the wetlands. Professor Wadden shot the adventure on Kodachrome and we came back with great imagery and our own great experiences in hand. 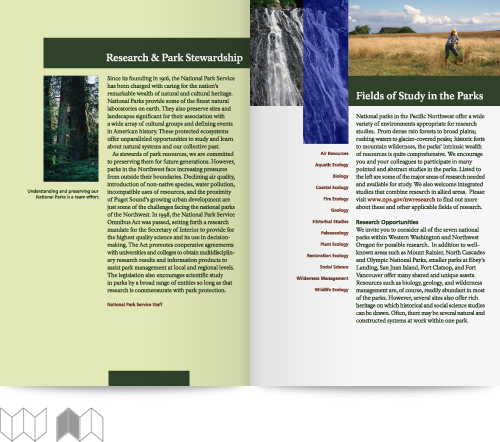 The brochure was a simple accordion-folded piece, including a letter of introduction, descriptions of the potential fields of study, a hand-drawn map of locations, and highlighted case studies of previous fieldwork, leading to a call to learn more via mail, phone, or, preferably, the dedicated web site. 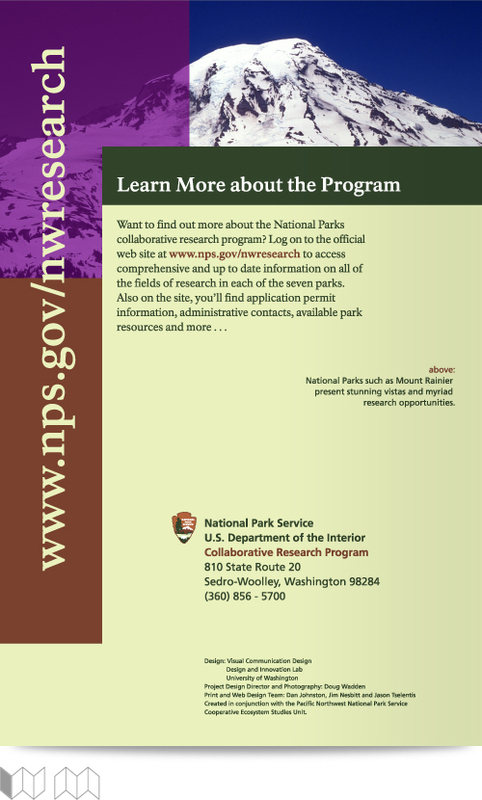 The National Park Service identity system was actually created by one of those design “legends,” so we didn’t want to mess with the general gestalt too much, but we take a few liberties to bring a bit more dynamism to the “universal style Modern” band and column system, stepping grid alignments and adding vibrant color overlays to photography. Concurrently, the complimentary web site took form. 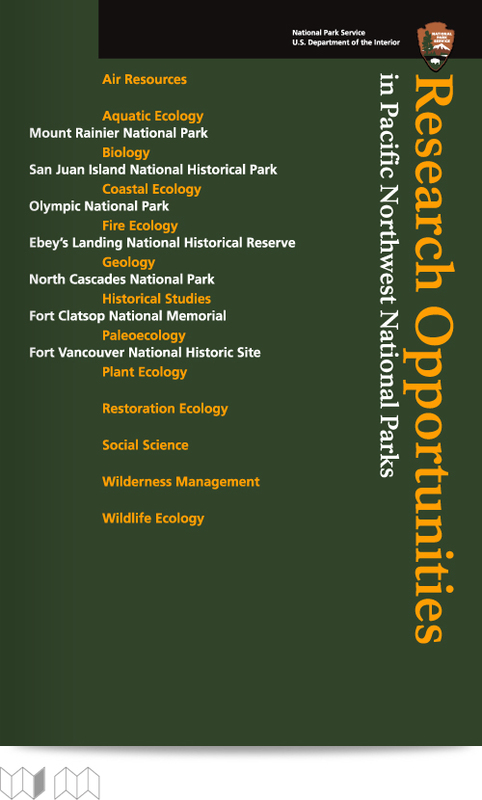 This comprehensive reference serves as the permanent hub where researchers can dig into detailed information on the parks and applicable fields of study, read up on case studies and apply to take their own research project(s) to the parks. Topics is cross-linked to the others for complete context and encouragement of participation. 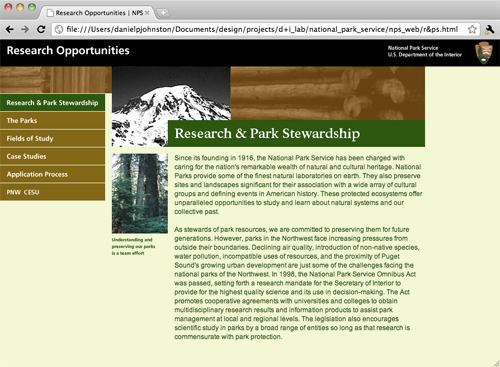 As it was before the widespread of contemporary content management systems (CMSs)—even those as simple as WordPress (on which this blog runs)—we implemented the site to work with since defunct software producer Macromedia’s “Contribute” program so that even park officials without any web programming skills could update content based on an easy, login-enabled text editor that simply overlaid the site. 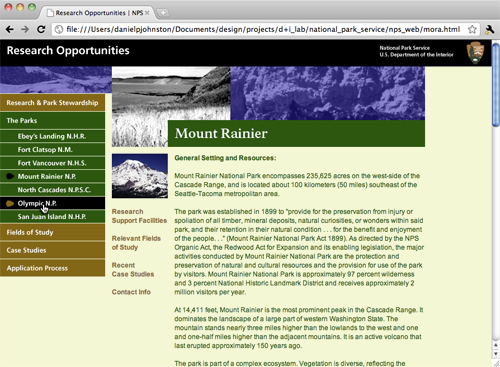 Of course, it was still a bit of a challenge for those who would rather be in the woods to sort through even this editing tool, so, even though I probably would have rather been riding my bike, I ended up consulting with Park Service representatives for months after the site launched to ensure they were comfortable taking over the content. But in the end, they had a robust system in their hands with which to connect with researchers for years to come. The printed piece was mailed out and otherwise distributed to thousands of potential program participants, and, as far as I know, both it and the site continue to work together to serve as primary reference points for the program. Naturally, I hope those that have participated discovered as much in their experiences as I did.